In a statement, Secretary of State Mike Pompeo described the discussions as "productive," but no specific date was given for the transfer of remains. The U.S. and North Korea held talks on Sunday to discuss the return of more than 5,000 remains of U.S. service members still missing from the Korean War. The discussions, which took place in the demilitarized zone between the Koreas, follow a commitment made by the North during the June 12 summit in Singapore to recover the remains of U.S. prisoners of war and those missing in action and immediately repatriate the remains of those that have already been identified. It was the first time in nine years that U.S. and North Korean first general-officers held talks. U.S. and North Korean officials agreed to resume joint field activities to search for the remains of Americans missing from the war, U.S. Secretary of State Mike Pompeo said in a statement. "Today's talks were productive and cooperative and resulted in firm commitments," Pompeo said in a statement. However, no specific date was given for the transfer of those remains recovered. Talks at the working level will continue on Monday. 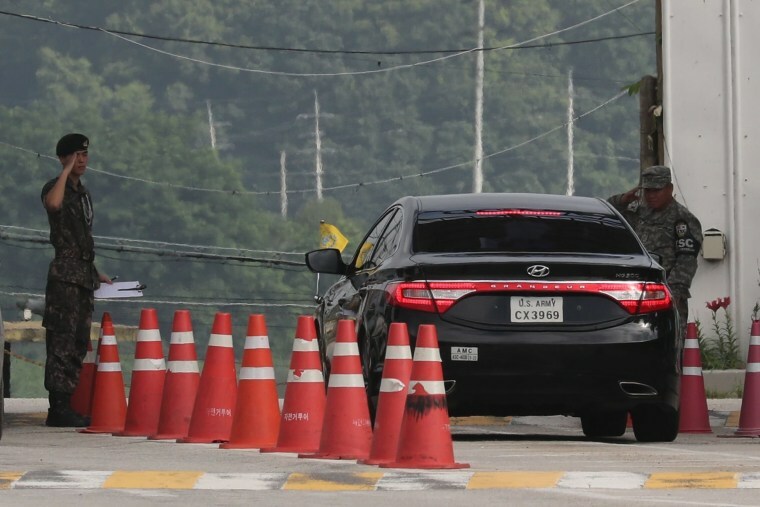 In late June, the U.S. military said it had begun moving caskets to the Korean border village of Panmunjom in preparation for North Korea to return the remains of U.S. soldiers who went missing in the 1950-53 Korean War. But efforts to recover and return other remains stalled for more than a decade because of the North's nuclear weapons development, which led the U.S. to claim that it could not guarantee the safety of recovery teams it sent during the administration of former President George W. Bush. Earlier this month, Pompeo traveled to Pyongyang where he met with vice chairman and former intelligence chief Kim Yong Chol and the two agreed the U.S. and North Korea would meet on or around July 12. Pompeo has described the commitment to recover the remains of U.S. soldiers as “the most personally meaningful part of the agreement,” between the U.S. and North Korea at the mid-June Singapore summit. Trump repeatedly boasted of the "incredible success" of his meeting with Kim Jong Un but, as of now, no remains have been returned as a result of the meeting. At a rally in Duluth, Minnesota, on June 20, Trump told the crowd that the remains of over 200 had already been sent back, and the following day the President remarked during a cabinet meeting. Trump repeated the claim on June 23. Military officials later walked back the statement stating that no remains had been repatriated since the summit.